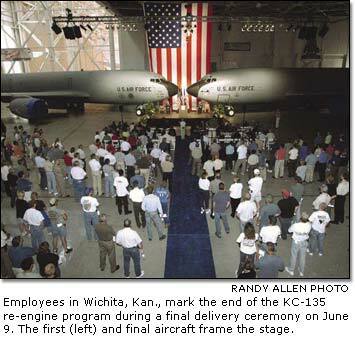 The U.S. Air Force accepted delivery of its 420th re-engined KC-135R aircraft during ceremonies at Boeing in Wichita, Kan., on June 9. The delivery marked the end of a program that began 25 years ago to provide the Air Force's refueling fleet with a modern engine. The re-engining program has increased the aircraft's fuel transfer capability by 50 percent and reduced fuel requirements by 25 percent. The KC-135 remains the only airplane in the world specifically designed for aerial refueling. "You've provided an invaluable capability that ensures a nation's success in the global war on terror and will ensure our freedom in the future," said U.S. Air Force Brig. Gen. Wendell Griffin. The KC-135 tanker entered service during the late 1950s and early 1960s. The KC-135's older engines, however, did not meet modern standards of fuel efficiency, atmospheric pollution and noise pollution. The re-engining program began in January 1980 when Boeing was awarded a contract to begin research and development for the engine retrofit. At 22,000 pounds of thrust, the CFM56 engine that replaced the KC-135's J57 engine provided a 60 percent increase in power. Related system improvements were incorporated to improve the modified airplane's ability to carry out its mission, while decreasing overall maintenance and operation cost. Because of its new level of performance, the modified airplane was designated the KC-135R. In addition to re-engining the Air Force's fleet of 420 KC-135 A/E-models, Boeing re-engined 25 Air Force RC-135s and 14 KC-135s from France. Additionally, seven surplus Air Force KC-135s for Turkey and four for Singapore were re-engined prior to their delivery as part of a Foreign Military Sales agreement.